Los Angeles and its erratic grid of freeways and streets, that fray out towards the hills and condense towards the ocean, already recognizable when arriving by plane, expose a history of city-planning that adjusted to massive immigration and a sprawl in size. After the First World War Los Angeles soon hit a population of two million immigrants, like geographer Anton Wagner analyzed in his comparative study “Los Angeles. Werden, Leben und Gestalt einer Zweimillionenstadt in Südkalifornien” in 1935, when he wandered through the city afoot. A method, which Reyner Banham consideres nonsense in his 1972 book “Los Angeles, the Architecture of Four Ecologies" as one understands Los Angeles best “in the rear mirror” of a driving car. Such conflicts in urban research accompany the writing and thinking about architecture in Los Angeles. Economical, ecological political, racial and ideational conflicts, specifics and confusions structure the city and its buildings. Following, the seminar devotes itself to this “logic of sprawl”: With detours to California’s complex immigration history, the question of “land use” and garden practices, Hollywood and film production and the explorations of “cinematic urbanism”. 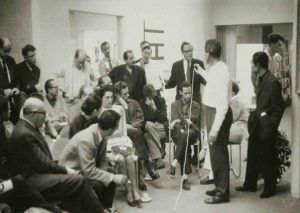 Starting from there the seminar takes a look at the experimental, modernist architecture from 1920–1960 in the Los Angeles area. Buildings by R. M. Schindler, Richard Neutra, Franklin D. Israel, John Lautner, Frank O. Gehry, William Krisel (et. al.) 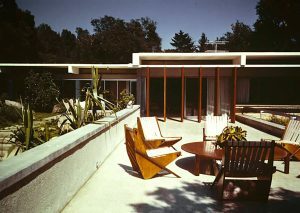 and the Case Study House program will be analyzed. 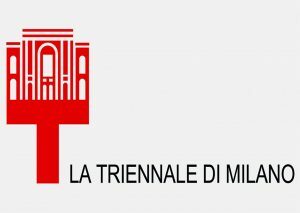 The Milan Triennial, one of the most important cultural institutions in Italy, is a tri-yearly international architecture and industrial design exhibition. It was established in 1923 in Monza as a periodical event with the goal to promote the applied arts and their relationship with architecture. The Palazzo dell’Arte, built by Giovanni Muzio in 1933 in Milan, has been since then the main venue of the exhibition. 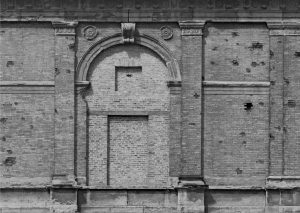 The events of the Triennial have been organised and/or attended by prominent architects and artists, such as Gio Ponti, Mario Sironi, Le Corbusier, Aldo Rossi, Rem Koolhaas, Peter Eisenman, Jean Nouvel, Juan Navarro Baldeweg, and many others. The topics explored and discussed at the various Triennials ranged from Italian Rationalism (1933), to post-war reconstruction and social housing (1947), to the study of proportion in art (1951), to the environmental challenges of architecture (1992). The seminar offers an overview of the history of the Triennial and of its main location, the Palazzo dell’Arte. 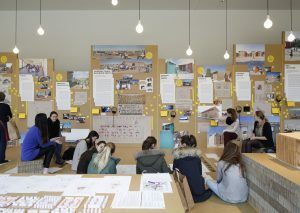 The goal is to analyse a selection of Triennials as “case-studies” with the topics related to them, such as the impact of the Triennial on Milan urban planning (QT8 district) or the reception of the Triennial abroad. Not only the content, but also the architectural design and display of the various exhibitions will be investigated. The overall aim is to examine how the Triennial, in ca. 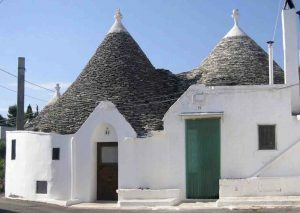 one hundred years of history, has contributed to the Italian and international cultural debate in the field of arts, architecture, and design. The architect’s field of expertise has changed rapidly over the second half of the 20th century as new technologies such as the Xerox machine (1959), the fax machine (1960s) and the computer (the Apple II came out in 1977) became available to the general public. While new skills have become a vital part of the architect’s daily routine today others were lost. This seminar takes a look at some of the changes that have resulted from the advent of the computer in architecture. The seminar is part of an ongoing research project in support of our upcoming exhibition “Pixels, Vectors and Algorithms. The Digital Revolution in Architecture” on the computer and architecture. Even though digital tools have been a prominent influence on the design and presentation of architecture over the past three decades, a reckoning with the implications of this watershed moment in architectural history has yet to happen. The main question that this seminar will address is simple: Have the new digital tools changed architecture and if so, how? With the help of a reading list of key texts by protagonists of the digital movement we will retrace a variety of aspects connected to digital architectural forms including folds, blobs, parametric design and artificial intelligence. Selected case studies will examine the influence that software has had on the design of architecture. Exhibitions on architecture can take the most varied forms, but they also have common characteristics. They generally differ from exhibitions on art: while in most cases artworks are only accessible to the public by means of exhibitions – meaning people only (or mainly) have contact with art when they visit an exhibition – everybody is confronted with architecture in the public space. Therefore what is the meaning and the additional value of exhibiting architecture compared to living with architecture? 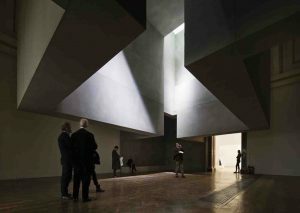 And how can architecture be presented and communicated within the scope of an exhibition? Apart from outdoor-exhibitions like the huge „Bauausstellungen“, which showcase architecture on a scale of 1:1, architecture is conveyed within exhibition spaces mostly by using other media – for example plans, drawings, renderings, photographs, films and models. These media were either developed during the design process or document the completed building in retrospect. Furthermore exhibitions on architecture can serve as a driving force for new developments in architecture by focusing on current issues, establishing relations between theoretical, political and cultural discourses as well as by proposing potential solutions. Together we will explore and discuss the history, theory and practice of architecure exhibitions in the seminar. A special focus will be put on current exhibitions and tendencies in the curatorial practice. In addition to short student-presentations and -essays, text-based discussions and visits to current exhibitions, active participation is required. The seminar includes a two-day field trip to Vienna (June 20 to 21, 2019) to visit, amongst others, the exhibitions "Critical Care. Architecture for a Broken Planet" at Architekturzentrum Wien and the "Biennal for Change. Brave New Virtues. Shaping our Digital World" at the Austrian Museum of Applied Arts/Contemporary Art (MAK) in Vienna. 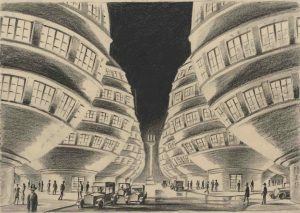 The Architekturmuseum of the Technical University of Munich houses more than 18.500 drawings and 2600 photos from the estate of architect Alexander von Branca (1919 - 2011). Following his education at the TUM and the ETH Zürich Branca led an architecture office in Munich an worked as guardian of cultural heritage. The list of his building projects is long and ranges from the Neue Pinakothek to the subway stations Theresienwiese and Marienplatz. Aside this he built churches, schools and libraries. The seminar will focus on the designs, competions and built projects of this architect. The highly honored baron would have been 100 years old in 2019. Students will have the opportunity to explore the museum’s archive space and work in direct contact with originals. Each student will select one of the architect’s projects, contextualise it according to the architect’s complete body of work, analyse it and compare it to other buildings. The question if there was a rupture in Germany in 1945, or a continuity of the Nazi period determining the reconstruction of the Federal Rebublic, is a controversly debated subject among professional groups and many parts of society. The construction activity takes on a central role, as it can be understood only in its context to the Nazi past. Unlike many cities in Germany which choose as a new agenda a „modern“ approach to reflect a new democratic attitude, a striking number of buildings emerged in Bavaria which followed suit to the Nazi period. The seminar serves to question and investigate the rupture and continuity, to understand for example, how the 70 percent destroyed old city center of Munich should be rebuild, and how to deal with the architectural remants of the National Socialism. To this end, the manifold history of coping mechanisms of the Nazi past, as well as the role and accountability of architects who were both in the Nazi period as well as in the subsequent Federal Republic active, will be discussed and researched. Visits of buildings and places which are tied to National Socialism, or were created in the 1950’s as points of departure into a new era are planned, as well as debates on Nazi-architecture, and its architects which were also sucessfully active in the Federal Republic. Talks and a visit to the Dokumentation Obersalzberg round off the class. As less and less contemporary witnesses remain, increasing importance falls on buildings and places to preserve remembrances to understand the historical correlations. Exhibitions have internationally influenced the development of architecture since the beginning of the 20th century. Due to their public nature they are an effective form to convey ideas and concepts to a broad public and to change the general perception of architecture. Ranging from the Werkbund exhibition in Cologne to the current Architecture Biennale in Venice, the lecture intends to provide a survey of important milestones of architectural history by means of specific examples, focusing on exhibitions that have taken a direct position towards current questions. The lecture aims at gaining an understanding of the complex theory and practice of architectural exhibitions as a specific design task by means of comparing analyses. You can get a summary of the class here. Bauhaus is an internationally familiar term for modern design, and especially for modern architecture of the 1920s and 1930s. At many schools of architecture and art the Bauhaus teaching method is used until today. In 1919 Walter Gropius founded the „Staatliches Bauhaus“ in Weimar as a reform school to combine arts and crafts. In 1923 the new motto was “art and technology a new unity”. 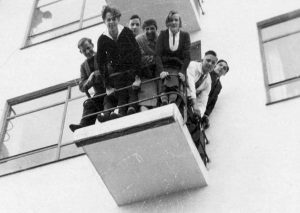 For political reasons the Bauhaus moved in 1925 to Dessau, where the reform school was named „Hochschule für Gestaltung“, became a communal institution and got a pioneering new building. In 1928 Hannes Meyer took over directorship of the Bauhaus, he was followed in 1930 by Ludwig Mies van der Rohe as third director, and in 1933 the National Socialists closed the school. Themes of the seminar will be the phases of the Bauhaus, its central ideas, its reception and global diffusion. Via tours to the historic places and sites the students shall discover the Bauhaus themselves. The excursion to Weimar, Dessau and Berlin is obligatory for a successful participation of the seminar. The number of participants is limited to 15 persons. Gottfried von Neureuther, August von Thiersch, Friedrich von Thiersch, Theodor Fischer, German Bestelmeyer, Roderich Fick, Robert Vorhoelzer, Hans Döllgast, Franz Hart, Werner Eichberg, but also well known artists such as Ernst Pfeifer Georg Brenninger or Fritz Koenig, taught since 1868 at the Technical University Munich. Who were these teachers and what traces did they leave in the cityscape of Munich? 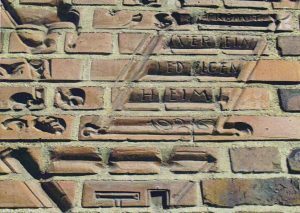 In a seminar paper students shall follow the tracks of Munich’s teachers of architecture and present through a tour of their own an architect/artist and his body of work. A preset layout will guide in the establishment of specfic „paths.“ A short biography combined with the body of work should be placed into an architectural context, along with a presentation of the most significant buildings. Photographs and short essays should accompany the specific architect’s pathway. Exhibiting Architecture is, necessarily, an architectural exercise. To display or communicate ideas within a space entails creating a three-dimensional organization and simultaneously reflecting on the container as an immediate context for the visitor experience. Taking this into account when thinking about exhibiting a building, even assuming the paradox of an external representation of its internal experience, can lead to the development of more engaging, memorable and comprehensive ways of translating architecture representation for a broader audience. This Workshop promotes the investigation of interactive, emotional, and wide-ranging strategies that include consideration of the experience of exhibitions in the broadest sense. 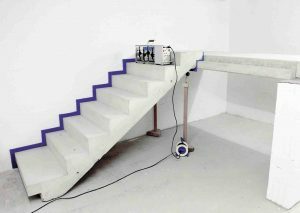 By designing an immersive exhibition space through a site-specific approach, students will be confronted with questions of scale and form, construction, legibility and sensorial experience within architecture, allowing them to explore the idea of producing architecture through curation, in the sense of disciplinary production, rather than “mere” representation. The advent of cybernetics in the post-WWII period seemed to fulfill an architectural dream of predictable performance and objective beauty. Conceived as a common language between man and machine, code provided the fantasy of overcoming the modern subject-object divide. Yet rule-based design has a long history: from proportions to standards, architects have repeatedly tried to not only prescribe form, but also exert social and political control. As rules were exported into material form, architecture became both an accomplice in constructions of governance. Hence “Design Rules” must also be looked at regarding their ideological intent and human consequence. 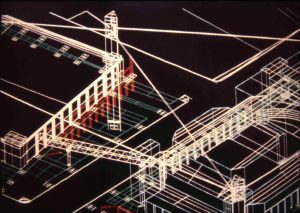 This seminar will examine a history of architectural production characterized by rules, codes, and laws. We will scrutinize both rules imposed from without—standards, norms, regulations—and those deliberately introduced as part of the design process—proportions, combinatorics, and algorithms. While typically viewed as a bureaucratic impediment, rules are in fact societal expressions and aesthetic tools. Furthermore, attempts to maximize control through systems often produced unpredictable results. The dream of control gained through codes and calculation is thus inseparable from risk, irrationality, and excess. In this seminar we want to ask: What are the architectural, spatial, and political implications of design rules, whether prescribed or self-imposed? How have irrational tendencies been complicit in, or even instrumental to, how design rules? Promoted by some constructivist architects related to the Union of Contemporary Architects (OSA), the concept of social condenser had circulation in the Soviet Union in the late 1920s. The term was used to describe a new architecture taking place ten years after the Russian Revolution, but despite it being stimulating, it was very open-ended since it did not limit itself to this or that architectural program. 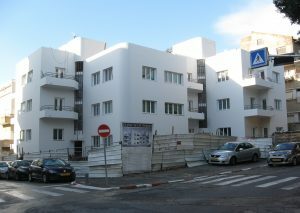 Yes, the social condenser referred to architectures that serviced the population, that had the capacity to accelerate society, but it could refer to housing projects like Moisei Ginzburg‎ and Ignaty Milinis’s Narkomfim (1928), as well worker’s clubs (think about the ones designed by Constantin Melnikov). Recent scholarship on the category of the social condenser has demonstrated that the term was effectively used for a brief period of time only, but it has been handed down to us by a series of resurgences, most importantly Rem Koolhaas’s deployment of the term since the 1970s, like in the manifesto “The City in the City – Berlin: A Green Archipelago” (written in 1977 with Oswald Mathias Ungers and others), and the fake patent for the social condenser published in Content (2004). In this Master Project we will investigate the idea of the social condenser both in its historical dimension and a category that offers possibilities for the current production of architecture. Our interest in the social condenser is related the Architekturmuseum’s forthcoming Access for All: São Paulo’s Architectural Infrastructures exhibition (June 2019), which engages with this rubric at several levels. The Master Project will be based on lectures, readings, and presentations of the students. We will collect case studies, produce timelines, think about representational problems, and work on a writing piece. The Master Project is accompanied by a seminar by Teresa Fankhänel entitled, “Writing Research Papers,” which is a practice-based exercise in reading and writing scholarly papers in preparation of the final essay in the Master Project. The main objective of the course is to provide students with a thorough understanding and practical knowledge of the necessary steps in writing a scholarly paper. Skills that will be trained include a basic understanding of historical and theoretical references in the humanities, researching archives, selecting sources, writing a research report, finding a thesis and writing a paper. This is a hands-on Master Project, both in the lecture-workshop and the seminar. Active participation is required before, during and after each session. There will be weekly small assignments consisting of readings, research and writings. See Michał Murawski, “Introduction: crystallising the social condenser,” The Journal of Architecture Volume 22, Issue 3 (2017): 372-386. Between 1928 and 1959 11 international congresses for „New Building“ (Congrès Internationaux d’Architecture Moderne), for short CIAM, was hold in different places in Europe. Accepted worldwide architects and urbanists, like Le Corbusier, Walter Gropius, Cornelis van Eesteren, José Luis Sert, Ernst May, Mart Stam etc. used the meetings to propagate and assert internationally their own positions and to expand their network. With the programmatic ideas, the Ciam defined the discussion about urban and architectural development, a discussion, which reach far into the post-war period. One hardly dares imagine the Ciam congresses as pure harmonic meetings, where the participants worked on a homogeneous guideline. On the contrary, they are characterized by violent discussions. In this seminar, we will focus on some important congresses and work out the divergent positions. In this way, we want to collect the wide range of ideas, understand the productive atmosphere and analyze the development of the different meetings. We approach the subject by describing important projects and by the biography of several protagonists. Above all we concentrate on the mediation of different topics: How were individual positions represented? Which instruments did architects use to launch their ideas? Who did the presentation? And how were the accompanying exhibitions organized? To get information material we use not only research literature. We are also doing an excursion to the CIAM-archive in Zurich where we get plans, photos and diagrams. Through the presentations technologies, we want to get further, especially new contents. Debates about the vernacular and vernacularity in modern and contemporary architecture, which usually refer to a local, impulsive or also a primordial approach to architecture, are currently a cutting edge matter. The vernacular is in dialogue with the contested subjects of the search for a national identity; ecological approaches; global, local, and “glocal”; and political ideologies. On one hand, it appears that there is a current architectural trend—for example Balkrisha Doshi, Anna Heringer, or Francis Kéré—that is oriented towards the vernacular. There is a worldwide demand to fallback onto basic conditions for architecture, local materials and simplified handling of the actual building processes due to diminishing resources and economic crises. On another hand,cities like Abu Dhabi try via the re-discovery of supposedly local forms to further stimulate tourism. These diverging appropriations of forms and constructions, which are considered vernacular, makes it again necessary to critically assess the subject. 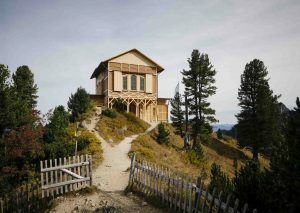 It can be observed that important western protagonists of architectural history, like Frank Lloyd Wright, Bruno Taut, Le Corbusier, Giuseppe Pagano, and Bernhard Rudofsky, among others, engaged at some point in their careers with the vernacular. If we expand the time criteria, actually since the end of the 19th Century architecture culture engaged with the vernacular, especially in the context of rationalisation and functionality. Through exhibitions and publications, architectural culture has conveyed a sense that the vernacular represents an impression of an authentic and ideal denoted architecture, as it was rooted in the culture of a specific living environment and thus seen as the origin of local building forms. The explorative view was placed either on building practices of architect’s home countries, or towards colonies. The seminar will analyze the reasons and motives for the prior and current debates in regard to vernacular architecture. Since when, why and with what criteria and reservations did architects approach the vernacular? How, and in what form, were designs and building practices influenced? And, how is the term “vernacular” currently used and how? The vernacular remains, especially in view of other terms like regionalism, traditionalism, primitivism and “Heimatstil” to be defined and discussed before the backdrop of postcolonial studies. The seminar aims for a theoretical engagement with the concept of the vernacular, especially in Europe, through analyses of buildings, exhibitions and publications by placing them in a larger political, cultural and social context. This class examines housing exhibitions (Bauausstellungen) and in particular the 1984-87 Internationale Bauausstellung (IBA) in Berlin. 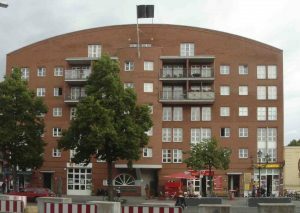 (Precedents like Weissenhofsiedlung 1927 in Stuttgart and Interbau 1957 in Berlin will also be examined). This class is about the history of architecture in Germany and in particular about the 1980s, the years before the fall of the Wall, when the IBA was another attempt to present West Berlin as a leading city for the international discourse on architecture. We want to know what exactly did the IBA promote and how? IBA had two main strategies, infill with the IBA-Neubau’s “kritische Rekonstruktion” (Joseph-Paul Kleihues), and refurbishing/restoration with the IBA-Altbau’s “Behutsame Stadterneuerung” (Hardt-Waltherr Hämer)—recuperating buildings being a “novel” idea then. (There is a connection with the TU now with the idea of “Bauen im Bestand”). At the time, the IBA-promoted projects in Berlin were polemical, and often times resisted. We want to understand the IBA in context, with its rights and wrongs. If the IBA was a model, we want to understand what type of model. Said different, a model of/for what? This class is about the connections between postmodernism and its opposites, the involvement of local architects and the invitation of key foreign architects to Berlin to build housing projects. The IBA was a platform for architects to contribute to the legacy of the Berlin: Peter Eisenman, Aldo Rossi, Rem Koolhaas, Zaha Hadid, John Hejduk, Raimund Abraham, Oswald Matthias Ungers, among others, were invited to participate. Another question is, how does this represent a late scenario of the Cold War that mobilized architecture for political purposes. A side question is, what was happening in East Berlin at this time? What were the reactions on the other side of the Wall? 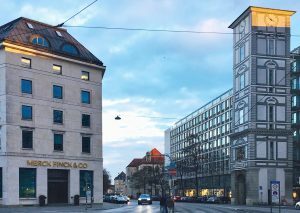 We will look at Nikolaiviertel, a historic quarter in Plattenbau designed to become a touristic attraction for the 750-year anniversary of the city. In brief, this is Berlin as a laboratory, a city that is reinventing itself, and unknowingly preparing the ground for what has taken place since the fall of the Wall. If these projects were “islands” in Berlin, did they make an “archipelago”? This is architectural speculation that was not on its way to make money—yet at the same time it was trailblazing the ground for speculators. Finally, the question for the students is, how could all (or parts of) this topic become an exhibition? * We will visit Berlin together with the students towards the end of the class. 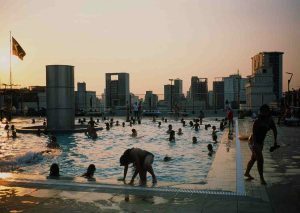 The seminar examines the 20 years of building activity in Italy under the fascist regime, with a special focus on exhibitions, urban planning, art, and the dealing with this difficult legacy. In a detailed introduction, tradition and modernity are critically scrutinized as antipodes in the architecture of this time and various aspects, such as the relationship between architecture and ideology, are analysed. 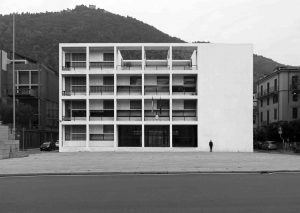 The protagonists, including Gustavo Giovannoni, Marcello Piacentini, Giuseppe Terragni, Giovanni Muzio, and Giovanni Michelucci, are profiled, and their buildings and designs examined in relation to the fascist government. The personal influence of Mussolini on architecture and urban planning is also an issue. Which building typologies and tasks played an important role? Which design language and which materials were preferred? To what extent has architecture (or architecture journalism) contributed to the propaganda? These and other questions will be discussed in the seminar be using specific case studies. When architecture is communicated in words, there are different text formats according to different occasions and intentions. This seminar is a laboratory for those words: We will read and analyze different texts, interprete them, have a look to their context and and finally also write our own texts. The variety of formats we will discuss includes manifestos and essays, blog entries and comments, interviews and project descriptions. By carefully reading, students will achieve a critical view on texts and improve their own capacity to convince with own words. 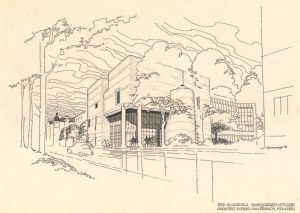 The Architekturmuseum of the Technical University of Munich houses a rich collection of plans and sketches by architect Hans Schwippert (1899-1973). As the long-term chairman of the Deutsche Werkbund and director of the Kunstakademie Düsseldorf, he was one of the most important proponents of post-war architecture. His design for the Deutsche Bundeshaus in Bonn (1948/49), the high-rise at Interbau 1957 in Berlin and the exhibition concept for the German pavilion at the World Fair 1958 in Brussels are examples of his work that were especially relevant for the history of architecture. 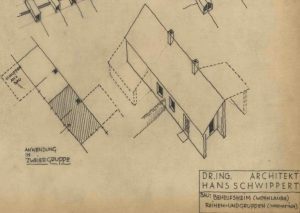 What remains largely unknown is that Schwippert also designed makeshift dwellings and emergency shelters for refugees – a subject, that is becoming increasingly relevant today. The seminar will focus on the designs and built projects of this architect. Find selected student works of this course here. The seminar will be held in preparation of the exhibition "Königreich der Musen -- Architektur in Bayern zur Zeit Ludwigs II. (1864-1886)" that will take place in autumn 2018 at the Architekturmuseum / Pinakothek der Moderne on the occasion of the 150th anniversary celebration of the TU Munich. In smaller groups the students shall develop an object that can be integrated in the exhibition with regard to its concept as well as to its design. It shall complement the selected exhibits in form and content and open up new vistas. Carl von Fischer, Friedrich von Gärtner, Friedrich von Thiersch, Theodor Fischer, German Bestelmeyer, Robert Vorhoelzer, Hans Döllgast, Franz Hart, Werner Eichberg, Sep Ruf or Otto Steidle, but also well known artists such as Wilhelm von Rümann, Bernhard Bleeker, Hermann Hahn, Georg Brenninger or Fritz Koenig, taught since 1803 at the Academy of Fine Arts in Munich, and starting 1868, also at the Technische Universität Munich, as it is known today. Who were these teachers and what traces did they leave in the cityscape of Munich? 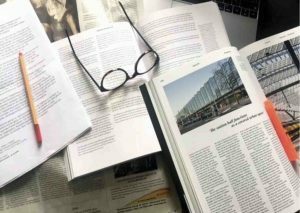 A short biography combined with the body of work should be placed into an architectural context, along with a presentation of the most significant buildings. Photographs and short essays should accompany the specific architect’s pathway. The class activities are conceived as walks through the town. During inclement weather, classes will be held indoors in the assigned room.